Atuh Beach is one of the coolest beaches on the south end of Penida island. Unlike Suwehan Beach, this one is not a secret and there are sunbeds, beanbags, and a couple of nice food & drink shacks here. 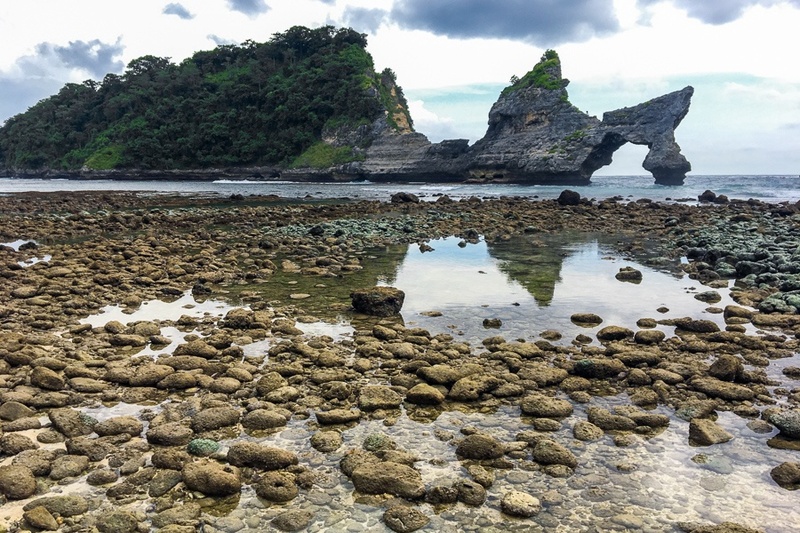 But the highlight of Atuh Beach is the big elephant shaped rock in the ocean (locals say it looks like a stiletto), and the huge variety of sea life that gets trapped in the rocks at low tide. All in all, it’s a really cool place to look around and chill for a couple of hours, and you can easily reach it from the other must see attraction on the southeastern part of the island: Rumah Pohon. Atuh Beach is on the southeast side of Nusa Penida island. It’s accessible by car or scooter, about 1 hour drive from the main docks and accommodation in northern Penida. From the parking lot for Atuh Beach, it’s a short walk and then a short but strenuous hike down to the beach. Atuh Beach has parking areas on both sides of the beach, but I’d recommend using the one at Raja Lima (shown in the map below) and then you can just walk over to Atuh from there. The parking location in the map below allows you to visit a bunch of incredible locations all within a short 10-15 minute walk of each other: Raja Lima, Rumah Pohon, Atuh Beach, and Diamond Beach.